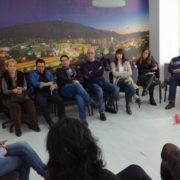 During March 2018, Partnership building meetings were held in Skopje and Podgorica. The aim of the first round of meetings was to facilitate the accomplishment of the Network’s goals and present objectives and main activities planned by the project IRIS NETWORKing – CSOs for protection sensitive migration management. Representatives of more than 25 organizations, members of the IRIS Network, gathered around the idea of contributing to long-term goals of the Network – increased quality of social and legal services provided by CSOs through capacity building activities, increased resilience and social cohesion of the local communities through civil society networking initiatives, strengthened national/regional coordination of the CSOs and public institutions in migration management and influenced reform processes in WB in order to improve service delivery for the migrant population. The meetings were co-organized by two Project partners, Open Gate – La Strada in FYRo Macedonia and SOS Telephone from Montenegro. Open Gate – La Strada, FYRo Macedonia – Open Gate La Strada is a leading Macedonian organization, known for its commitment, perseverance and professionalism. The activities of this organization are focused on the needs and interests of victims of human trafficking, but also on members of other vulnerable groups. The main goal of Open Gate La Strada is to invest all efforts and capacities in creating a society free from inequality, poverty, prejudice and discrimination. Open Gate La Strada is an organization committed to combating violence and human trafficking, which aims to build society as a place where human rights are widely respected and all citizens have equal opportunities for socio-economic independence. SOS Podgorica, Montenegro – SOS Podgorica is a non-governmental, non-profit and non-partisan organization that provides support services to women and children who are victims of violence. Their mission is to eliminate every form of discrimination and violence against women and children through education, providing assistance and support to victims of violence and through cooperation with governmental institutions.